It is significant that Friedman and Schwartz never use the phrase “the Great Depression”; instead, they speak of “the Great Contraction” of the 1930s, addressing the reduction in the money supply while treating the fall in employment and output as a secondary matter, the consequence of bad government policy that caused “the Great Contraction.” By flattering the prejudices of economists who want to believe in the natural stability of free markets, Friedman and Schwartz’s story has become the accepted explanation of America’s worst economic disaster. Bernanke, for one, confesses that he was inspired by their work; “hooked” in graduate school, “I have been a student of monetary economics and economic history ever since.” Pushing on an open door, Friedman and Schwartz persuaded most orthodox economists, and that part of the political elite that listens to economists, that the economic collapse that began in 1929 was an accident that would have been avoided by reliance on free markets and competent Federal Reserve monetary policy. Bernanke had five years to ponder this promise before he faced a worthy challenge; and then he acted with the vigor of a Friedman/Schwartz acolyte. When this decade’s housing bubble began to deflate in early 2007, major financial firms like New Century Finan-cial and Bear Stearns reported major losses, and confidence in the U.S. financial system began to collapse as swiftly as in 1929-33. In early August, the rising tide reached tsunami dimensions when the International Monetary Fund warned of a trillion dollars in bank losses from bad mortgages. This was Bernanke’s moment. Channeling Friedman and Schwartz, careful to avoid the mistakes of 1929-33, the Federal Reserve moved quickly in early August 2007 to provide liquidity to financial markets. It acted again on August 17 by cutting mortgage rates. More cuts came on September 18, on October 31, and on December 11. Then, on December 12, the Fed announced the creation of a new facility formed with the Europeans (Term Auction Facility, or TAF) to provide $24 billion in additional liquidity to financial markets. After still more interest rate cuts in January 2008, a new special lending facility, with $100 billion, was established on March 2, along with another $75 billion for the TAF. Then, on March 11, another new facility was created, the Term Securities Lending Facility, with $200 billion. And all this was long before the bailouts of Fannie Mae, Freddie Mac, AIG, or the federal government’s trillion-dollar Toxic Assets Relief Program (TARP). If insanity consists of doing the same thing over and over again and expecting different results, then the Federal Reserve went insane after the summer of 2007. Never before has it acted this aggressively in trying to get ahead of a financial market meltdown. Under Bernanke, the Fed has increased the money supply by over 16% in less than two years, nearly mirroring the 18% drop in the money supply in the same period after the stock market collapse of 1929. Had he lived, Milton Friedman would have been proud. 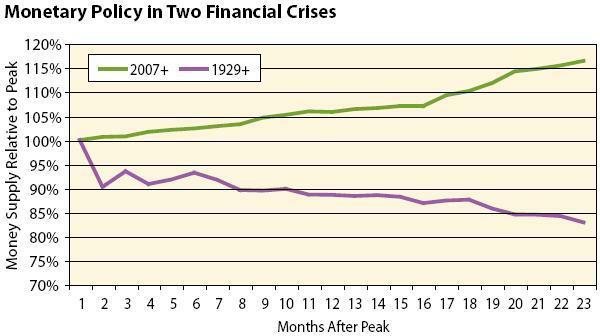 The one thing that has not changed between the crisis of 1929+ and the crisis of 2007+ has been the behavior of the real economy. Bernanke has avoided his predecessors’ monetary policy mistakes, but he has not prevented a sharp economic downturn. Since 2007, the economy has lost nearly 6 million jobs, including over half a million in the last month. At 8.9%, the April 2009 unemployment rate unnervingly equals the 1930 figure. We have a long way to go before we hit Great Depression level unemployment; but we are only in the second year of this collapse. And monetary policy is not helping. Here, then, we see the legacy of Friedman and Schwartz. Confident that capitalist free markets naturally move towards a full-employment equilibrium, Bernanke and his allies saw the need for only one type of government action: providing liquidity to the banks in order to strengthen confidence in the financial markets. Guided by Friedman and Schwartz, Bernanke has provided nearly unlimited aid to the Wall Street bankers and financiers responsible for our current economic collapse. And he has starved the real economy-businesses, workers, and homeowners-to avoid interfering in free markets. Gerald Friedman is a professor of economics at the University of Massachusetts at Amherst. Sources: Remarks by Governor Ben S. Bernanke at the Conference to Honor Milton Friedman, University of Chicago, November 8, 2002,; Milton Friedman and Anna Jacobson Schwartz, A Monetary History of the United States, 1867-1960 (Princeton U. Press, 1963). ; Milton Friedman and Anna Jacobson Schwartz, A Monetary History of the United States, 1867-1960 (Princeton U. Press, 1963).